Happy Friday everyone! The weekend couldn’t get here soon enough! Between the bipolar Chicago weather and my husband and I sharing colds, it’s been a not so fun week! This Friday is extra special though because it is my husbands 31st birthday! He’s never really been into celebrating birthdays, but I love it! Presents, cards, balloons, cake?! Does it get any better than that? I think not! Because we are both getting over colds, overall it’s going to be a relaxed weekend; however, we do have some fun things planned like a nice dinner, movie, and presents on Saturday, then brunch with family on Sunday. I’ll probably be stuck finishing my atrocious accounting homework (accounting is the WORST, so I give props to those of you that are accounting whizzes) but I won’t let that bring me down! Today is my very first “Five Things Friday” post! I’m so excited to share all the fun things with you that I come across. I’ll be honest with you and say that initially I thought five things sounded like a big undertaking, but as I started to collect ideas for this post, I found it hard to narrow it down just to five! As someone that suffers through the brutal Chicago winters and is also plagued my sensitive skin, it’s hard for me to find a moisturizer that doesn’t irritate my skin or feel greasy. Curel is fragrance free and truly leaves my skin (especially my hands) feeling soft and comforted. It also lasts a long time so I don’t have to constantly reapply! 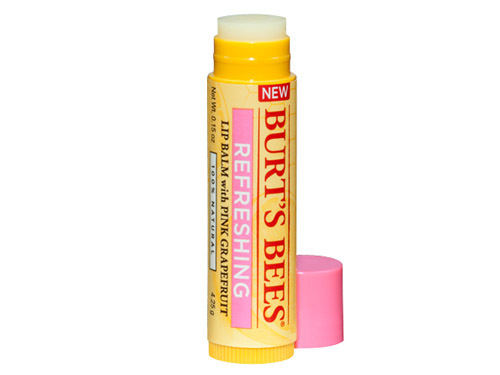 I love all things Burt’s Bees and I especially love this lip balm. This stuff smells INCREDIBLE! Seriously, it smells so good you will want to eat it, but don’t because that is kind of gross. This lip balm is silky, refreshing, and doesn’t leave my lips feeling like they are covered in wax. I have been seeing this site popping up everywhere. For those of you that don’t know, it is a personal styling website and works great for the “ensembley challenged” (Clueless reference, anyone?) like myself! After you sign up, you fill out a questionnaire that is called your “style profile.” It assesses your clothing style, accessories and budget. A stylist will then mail you five items that they think you may like and you are able to keep everything or mail it back. There is a $20 styling fee that is applied towards the items that you chose to keep from the shipment they send. I signed up for a monthly fix and they automatically send a new shipment every 30 days. I like Stitchfix because it eliminates the hassle of going to the mall and trying a million things on OR buying clothes online and receiving them only to find out that they don’t fit and having to return it for a refund. StitchFix is also helpful if you are like me and aren’t entirely sure of what clothing items, accessories, colors, or styles to pair together for a finished look. It’s been especially cold here in Chicago and the cold weather makes me crave something that is warm and comforting so for the past few weeks, I have been on a giant soup kick. Every Sunday I pick out a new recipe from one of the many food blogs I visit, and I make a giant pot of soup to enjoy throughout the week. Soup is one of those things that you really can’t mess up! You just chop and throw everything into a pot to cook with a broth of your choice. How easy is that? Not to mention, it gives you the excuse to enjoy a giant, crusty, warm piece of bread along with it! First of all, let me say that I am notorious for buying bottled water and reusing them. I know that not only is it not the best idea (nor the healthiest) for me to do this, but it also doesn’t give me the opportunity to really track how much water I am consuming. I purchased this blue 32oz Nalgene water bottle at Target a while ago. It has forced me to become more conscious of staying hydrated throughout the day. The water bottle is marked with millimeters which makes it easy to measure how much water you are drinking. I’m also a big fan of ice water, and the wide mouth on this bottle is perfect for adding ice cubes. Nalgene water bottles are also BPA free, dishwasher safe, and extremely resistant to both hot and cold beverages. They come in all sorts of fun colors and can be customized to your liking, so if blue isn’t really your thing you could always opt for this cute pink heart bottle.